Green Thumb, 5,000 SQFT Coverage, 16 LB, 24-0-12, Step 4 Premium Winterizer Lawn Fertilizer, phosphorus free. formulated for fall application to prepare your turf for winter dormancy. Special root-building formula contains essential nutrients that encourage stronger and healthier seedlings. Contains slow-release nitrogen for the extended feeding of your turf. 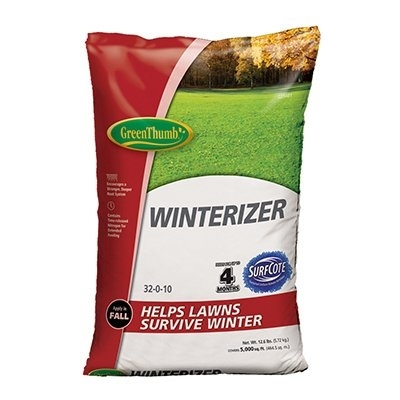 Apply in the fall to protect turf during winter and for a better lawn in the spring.